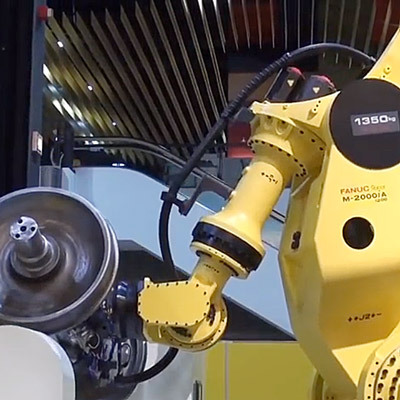 The strongest 6 axis robot on the market, the M-2000 series comes with a handling capacity up to 2.3 t and a reach up to 4.7 m. This makes it the ideal choice for handling and palletising heavy parts. Its outstanding vertical 6.2 m lifting stroke and horizontal reach makes processing even the largest of workpieces easy. 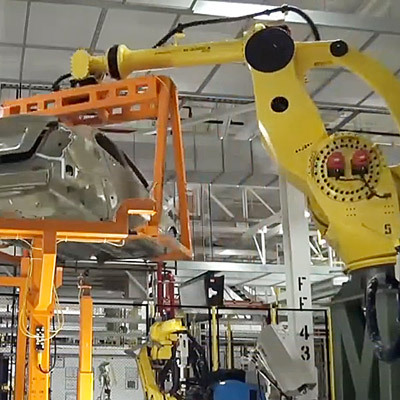 Especially suitable for the automotive or metal industries, these heavy payload robots lift complete cars efficiently and safely. The M-2000's unrivalled wrist capacity means it can handle extremely large parts such as complete automotive chassis and foundry parts. Boasting the longest reach on the market, the M-2000 can do the work of conventional cranes, hoists and shuttles to increase output and eliminate dangerous manual work. 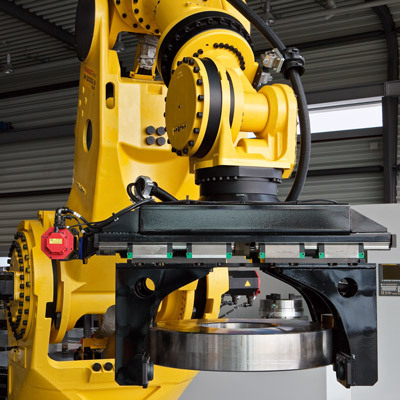 Purpose made heavy-duty components proven through extensive testing guarantee that the FANUC M-2000 is capable of thousands of hours of continuous heavy operation. 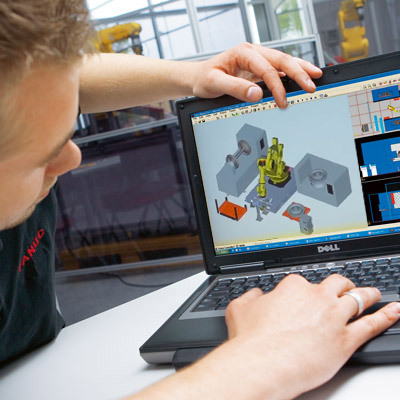 By simulating your production scenario, Roboguide shows you exactly what the M-2000 can do for you and where the savings lie. The M-2000 is ideally suited to harsh operating environments thanks to its IP67 protected water and dustproof wrist and shoulder-mounted motors. 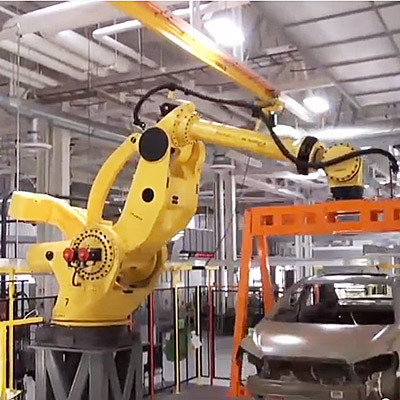 By cleverly situating the M-2000's wrist motion motors on the robot's J3 shoulder, the risk of damage through heat or harsh operating environments is reduced to zero. Good air cooling at the wrist motors enables high loads and high duty cycles. Moreover, despite this model's size, accessing narrow spaces is not a problem thanks to the slim design of its arm. 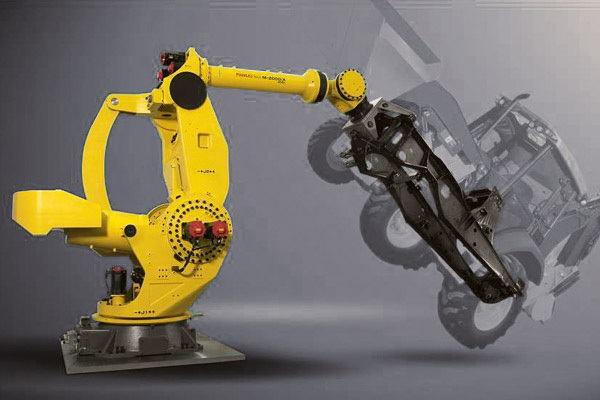 Sealed wrist units make the M-2000 industrial robot a safe choice for heavy-duty applications involving dust and water.